Mold stains are a problem that you may have to face at more than one point in your life. It is a fungus that is likely to grow in humid and moist environments. 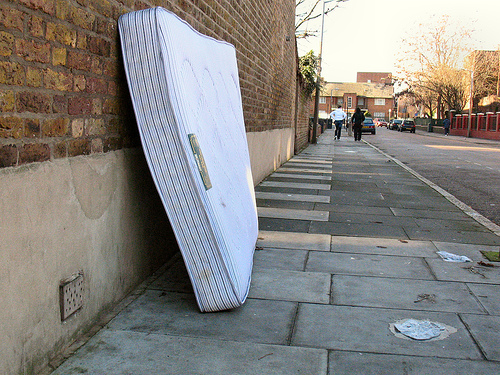 Mold on mattress can be especially dangerous. Dropping too much water on your mattress or sleeping on the mattress with wet hair without the water drying up in 48 hours can develop a breeding ground for mold. Not only does mold produce an unpleasant odor and is aesthetically repulsive, but it also acts as a health hazard for you, causing allergic reactions and respiratory problems. Without the proper cleaning of your mattress, mold can grow again on it. You must act as soon as you see the mold. Not only must you remove the mold, but also all mold stains, minimizing the chances of re-growth of mold. Following are the ways through which you can treat mold stains that have appeared on your mattress. 1. Before you start cleaning the mold of your mattress, remember to wear gloves and a mask. Otherwise, mold can prove to be harmful for you. 2. The first step towards a clean mattress involves taking the mattress off your bed, and carrying it outside in the open where the sun rays can reach it. 3. Do not lay your mattress on the ground. Place a blanket or a sheet beneath the mattress to avoid it getting dirty. 4. Take the nylon brush, and brush away the entire mold on your mattress. 5. Now to remove the mold stains from your mattress, firstly, make the cleansing solution. Pour one part 3 percent hydrogen peroxide in to a spray bottle, and add 3 parts water in to it. 6. Spray the cleansing solution on to the affected area such that it lightly soaks. 7. Now, let the area dry. Once it has dried, apply the cleansing solution again. 8. After 15 minutes of application of the second round of the cleansing solution, take a clean, slightly moist cloth and scrub the affected area. This will remove any solution that may still be remaining on the mattress. 9. Your stains have now been removed. However, before you carry your mattress back inside; let it dry in the sunlight. Warning: It is possible that hydrogen peroxide fades the color of your mattress. Hence, it is recommended that you test the solution on a small patch on the side of the mattress before using it. 1. Wait! Before you do anything, it is essential that you put on a pair of gloves and wear a mask. 2. Now, take the mattress off your bed, and carry it outside. This will not only kill mold on your mattress, but also allow the cleansing solution being used to remove the stains to dry quickly. 3. Lay down a blanket or a sheet on the ground first, and then put your mattress on top of it. 4. Once you have gotten rid of the mold on your mattress, prepare the cleansing solution for the removal of its stains. Pour 1 cup of isopropyl alcohol in a bowl, and add 1 cup of warm water to it. Your cleansing solution will be ready after you have mixed both the elements. 5. To apply the solution on to the mattress, dip a cloth in the bowl. Squeeze out the extra solution from the cloth. 6. Next, start scrubbing the affected area with the cloth. Move from the outer edges towards the inner side in a circular motion. 7. Once the mold stains have been removed, empty the remaining solution in to the sink, and pour water in the bowl. 8. Take a sponge, and dip in to the bowl of water. 9. Now, scrub the affected area with the sponge so that any residual of the solution is removed. 10. Do not take the mattress to your room immediately. Let it dry in the sunlight. 11. To kill any remaining mold particles in your mattress, spray a disinfectant solution all over your mattress. Remember not to soak your mattress in the disinfectant solution completely. Spray a little only. 12. You can take the mattress back inside once it is completely dry. 13. If the unpleasant odor of mold remains despite cleaning it many times, it is better to get rid of the mattress. The alcohol and water cleansing solution may fade the color of your mattress. It is recommended that you experiment the solution on a side patch of the mattress before using it. water damage San Clemente company specializing in flood, fire, mold, and sewage clean up projects in South Orange County. Well it’s a pretty hard task to remove stain from a mattress of a bed, the ordinary type of mattress are getting hard or dirty in a few days and it has lost their shine and comfortablity and we its very hard to wash them and after one wash they are going to be in useless condition, so its such a waste of money or your time. I advised you always to purchase a best Memory foam mattress topper it will not get dirty as soon and this is easy to wash and it will not lost its comfortablity and durability after a wash. Molds are definitely the toughest dirt to remove. Besides it being potentially dangerous, once it reach your fabric it leads a certain stain, just like the ones I used to read via http://www.education.com/question/advice-cv-editing-services/. I'm wondering why you recommend the hydrogen peroxide solution be applied using a spray bottle, while the alcohol solution be applied with a cloth. Will the alcohol disburse too much in a spray bottle? I have alcohol and a spray bottle and was about to go to work with them. How do you get rid of the mold in your clothes and in this example on the mattresses ??? You see I run a water damage company in Dallas and many of my customers have asked me about this. So I was just wondering how I can help them with the same problem you are facing ??? nuvanna mattress coupon saves $125 on the most comfortable mattress you will see today.